London 2012: U.S. Women's Gymnastics Team Wins Gold Medal; First In 16 Years : The Torch The U.S. women's gymnastics team has won the team gold medal at the London 2012 Olympics, handily beating Russia, which took silver, and Romania, which took bronze. China finished fourth. Young Skywalker: Gabby Douglas helped solidify the U.S. women's team grip on gymnastics gold. The Americans beat Russia and Romania. The U.S. women's gymnastics team has won the team gold medal at the London 2012 Olympics, handily beating Russia, which took silver, and Romania, which took bronze. China finished fourth. Update at 2:25 p.m. EDT: The U.S. women led off with their strength — the vault. The apparatus gives them an advantage, and not only because Maroney is the world champion and gold-medal favorite in the event. "All of the Americans do Amanars, one of the toughest vaults in the world — a roundoff onto the takeoff board, back handspring onto the table and 2.5 twisting somersaults before landing. It's got a start value — the measure of difficulty — of 6.5, a whopping 0.7 above the vault most other gymnasts do, and they ripped off one massive one after another." Their performances held up throughout Tuesday's final, with Douglas anchoring the team in all four events. The Americans won a team gold for the first time since 1996. And they fulfilled the promise seen in them by someone who knows about gold-medal-caliber teams: Bela Karolyi, who coached the 1996 squad. Karolyi says the Americans have "the deepest team in the world," according to The Detroit Free Press. "I think this is a more even team with their performances," he added. "The 1996 team had ups and downs." Update at 1:55 p.m. EDT: The American women's performance is winning many fans on Twitter — among them is Dominique Moceanu, a member of the Atlanta 1996 team. 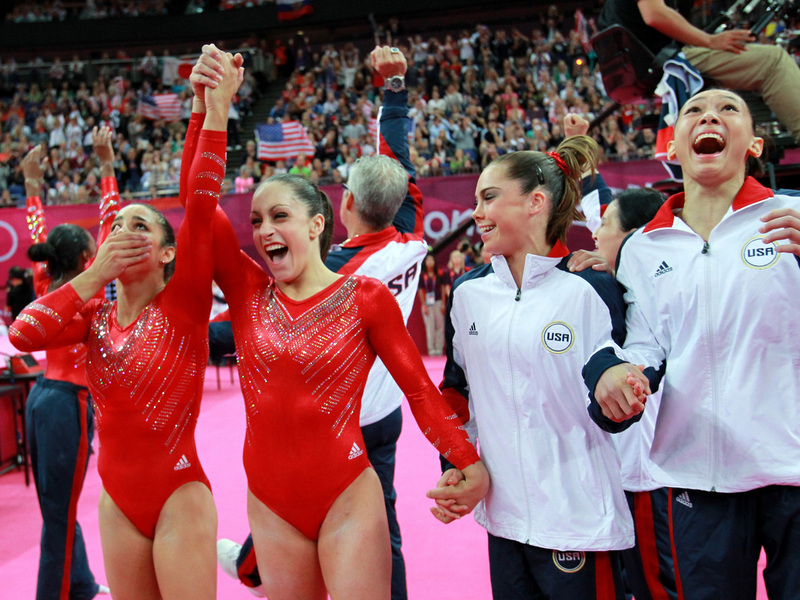 In a tweet naming Wieber and the other team members, Moceanu wrote, "Passing the torch to 2012 Team USA Women!" The Olympic gold medal is the second in the history of U.S. women's gymnastics. Alexandra Raisman, Jordyn Wieber, Mc Kayla Maroney and Kyla Ross (left-right) of the U.S. women's gymnastics team celebrate their gold medal. The U.S. team finished with a strong floor round, but they were in control for much of Tuesday's final. Their final score was 183.596. Russia was a distant second, at 178.530, with Romania trailing at 176.414. The rest of the final eight: China, Canada, Great Britain, Italy, and Japan, which came in last with a score of 166.646. Update at 5:43 p.m. EDT: The American team was made up of Gabby Douglas of Virginia Beach, Va.; McKayla Maroney of Long Beach, Calif.; Aly Raisman of Needham, Mass. ; Kyla Ross of Aliso Viejo, Calif.; and Jordyn Wieber of DeWitt, Mich. Note we've rewritten the top of this post to reflect the news.